In our day to day life, we produce a lot of wastes. But throwing them in garbage bags without treating them will only increase the pollution in the earth. However, if you have a garden, then you can extract beneficial compost out from this waste that will aid in making your garden better. 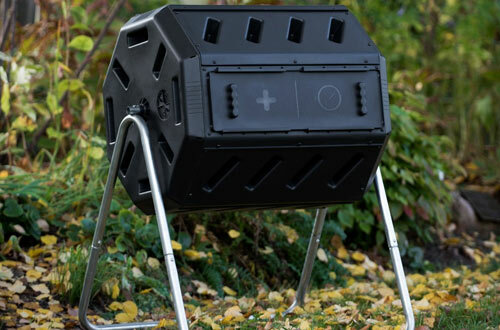 Thus, using compost tumblers are not only amazing for your garden but also the environment. Usually, it has two chambers; one can neatly section organic and inorganic waste. But finding the best one that will make no compromise in producing the finest results is tough. 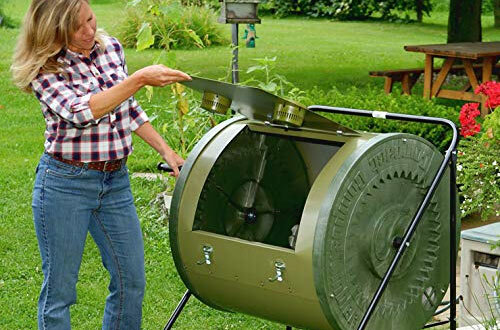 As a matter of fact, we have prepared a buying guide for compost tumbler that will surely help to come to a meaningful conclusion. 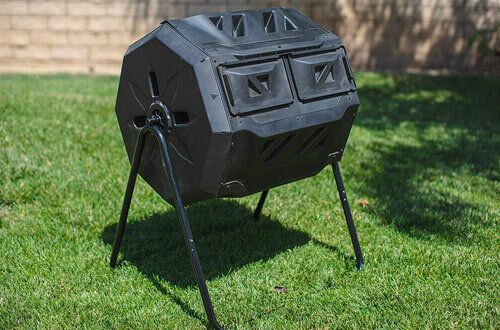 Having dual chambers and saving you from touching the compost, the tumbling composter has a storage capacity of 37-gallon. It is truly perfect for small and medium households. So, you get to have a large space for better decomposition and piling. Whether a patio or an extended deck, it looks great on both. Being 8-sided in its basic format, one can just close the door and turn it at a rate of 6 times every 3 days precisely. Furthermore, with sliding removable doors, this makes removal of compost comparatively easier. Also, the dual chambers ensure that it can be used in two seasons alternatively. 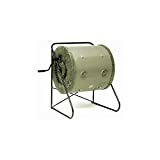 Its durable construction standards and consistent oxygen supply make this tumbling composter better rather than its competitors. As a matter of fact, recycled polypropylene external body inhibits UV rays and is BPA-free. Finally, the steel compost tumbler frame is galvanized. Thus, corrosion and degradation under sunlight will be at bay. Comes with dual chambers that allow completion of one side of compost before starting off with another. Consistently swapping sides allows the continuous addition of fresh scraps. Certainly, have air-vents that are adjustable to allow maximum aeration. Weather-resistant and rugged in nature yet light in terms of weight. Approved by FDA US, this is the most aesthetically pleasing composting bin that you will find suitable for decomposing both liquid and solid compost. With every spin, its cover is faced upward easing the composting process. Not just that, this is specifically known for working in cooler climates and requires no specific assembly in the process. 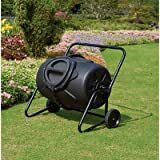 Further, it has a capacity of both 17 gallons and 35 gallons (as you may choose). The components used are safe against UV rays. Requiring no assembling, this is extremely durable in nature and matches all the policies of HOA. Also, it uses antioxidant protected and food-safe materials. Thus, it stands up tall claim of being environment-friendly in nature. Created specifically from rust-free and BPA-free material for maximum durability. Backed with a 5-year warranty period against workmanship and manufacturing defects. To ensure maximum airflow, it comes enabled with a 3-air vent format. An interlocking design on the drum’s door rather ensures that the lid is kept tight. 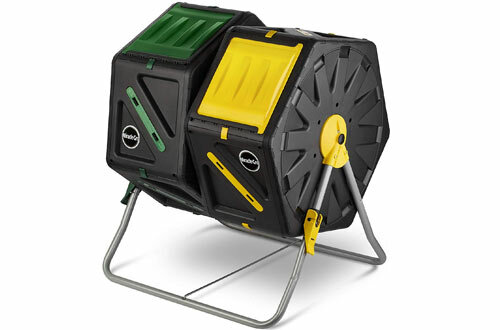 A truly miraculous product from Miracle-Gro- this composting tumbler comes with dual chambers. And so, allows faster movement to ensure maximum decomposition within a short span of time. In fact, as one side decomposes the waste, the other side allows cooling time ensuring maximum compost. Having internal mixing bars that help in composting within a span of 4-6 weeks, you can consistently keep mixing the scraps from the sides. Add on? The pair of water-resistant and latex-free gardening gloves from Scotts! Made of recycled and protected polypropylene with BPA-free format. 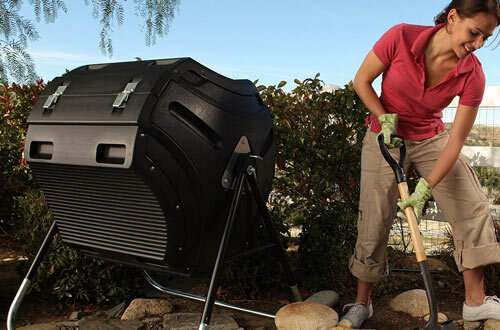 The rolling barrel compost tumbler design is easy-to-grip as the built-in handles make it suitable for assembling. The galvanized steel is weather and corrosion resistant. 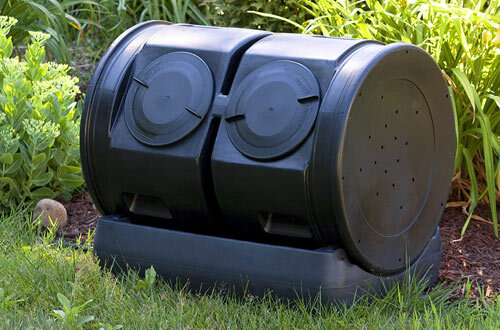 Indeed made specifically UV-resistant and keeps toxins out for fertile compost. Here comes a compost tumbler with a lifetime warranty and a large capacity for waste storage. 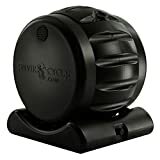 The BPA-free polyethylene of high-density construction is top-notch; it features plastic as well as powder-coated steel. While it’s internal bars help to mix the oxygen to better the standard of compost. 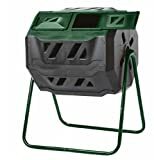 Moreover, the compost tumbler weighs over 40 lbs, this has a capacity of 80-gallon. Plus, its singular tumbler is positioned in a manner that helps to maintain the axis level in a balanced position. It rather has double-layered cover for durability. Certainly, the material is decomposed in a small span of time. Lastly, the black panels have a heavy-duty format that not only absorbs the heat but also maintains the same. Has aeration bars in the interior domain that ensures proper mixing of compost as well as air-flow. Features a galvanized steel base composter too. Certainly has a corrosion-free format. As a matter of fact, the composter tub is well-enclosed and there are no untoward intrusive particles. 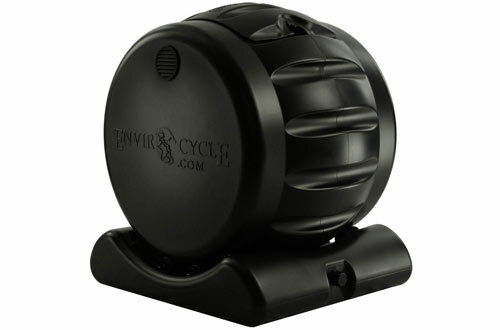 Known as double compartment compost tumbler, this is seated on a steel frame that is tubular in nature. It is suitable for protection from rats and pests in general. Indeed it is elevated and is almost 10% greater in capacity than its counterparts. With assembling time being within 20-25 minutes, this design makes composting an easy process. 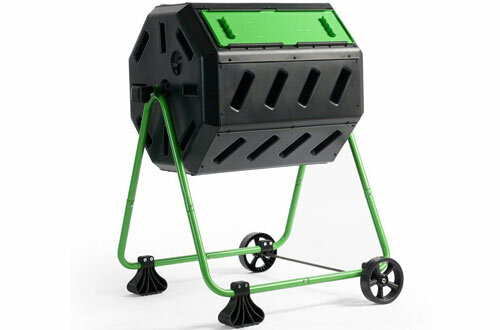 Hued in black and green, this is suitable for small households and is perfect for organic compost. Furthermore, the dual compartments help in organizing the waste properly. As a matter of fact, it aids to keep organic and old waste separated from each other. Has a capacity of 43-gallon and weighs merely 24-pounds. Enabled with dual chambers with a two-stand option for stability. Indeed have air vents that are adjustable to maximise composting process. 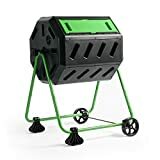 Coming from the house of MaxWorks, this is one of the best compost tumblers that is both space-efficient and saves you some cash. It has a composting period of 2-4 weeks and has a dual-chamber format. Plus, the powder coated steel frame extends its durability feature. 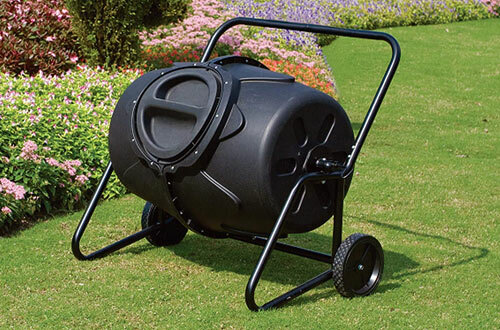 Apart from its 42-gallon capacity, this includes air-vents that are adjustable and enhance the composting process. It allows churning for 5-6 times. Moreover, the separate panels are used to decompose soil waste in an eco-friendly manner. Certainly, the rugged polypropylene constructions promote its durability features. Dual chambers available, one for storing the mature compost, another one for storing new scraps. Have sliding doors for maximum oxygen circulation process. For those looking for composting tumbler with a base that will justify the tea-collecting style, this one is to check! With a capacity of 25-gallons, this 7-cubic foot tumbler is known specifically for its low-maintenance design and dual chambers. For keeping it safe from the environment, it makes use of BPA-free and FDA approved plastic for constructing the body. As a matter of fact, it is a secured product for your kid as well as a pet. Now in order to save the waste from spilling or leaking, the chambers feature twist lids of 8-inches. Holds a warranty period of 1-year. Certainly durable in terms of a lifetime performance and perfect to be recycled. Touted as the most budget-friendly option amidst all its counterparts, this has a steel frame attached to it. Plus, it is made of black recycled plastic that is UV protective. Having a large opening that ensures easy addition and removal of scraps, this requires a minimal time-period of 2-weeks to create this compost. Moreover, for controlling the level of oxygen circulation, the air-vents are adjustable. 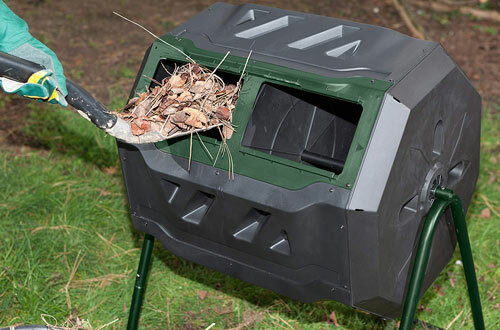 To keep the process secured, the composting tumbler is rather rodent-proof. Certainly, the hand-holds are inbuilt. Has a capacity of 37-gallons and weighs only 29-pounds. Dual chambers for completion of composting and additionally forming new compost. Durable in nature with wheels for easy movement. Easy to use, perfect for starters, 50-gallon capacity-these are the prime concerns of this Kotulus! Coming with dual wheels on the posterior side, this eases the rolling process. And especially when you have to move it from here to there. Also, its affordable rate and easy assembling process make it a sure-shot winner. Further, it requires minimal time for completing this composting process. It has a mixing fin that will aid in finely breaking down any sort of clumps. Has heavy-duty tubular steel frame. Enabled with mixing fins that are in-built to help in air circulation. Recycled plastic drum providing an eco-friendly way. 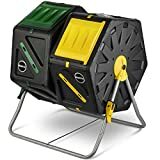 If you have a smaller garden, then investing in huge compost tumbler has no value! In that case, this tumbler from Mantis is a great option. Weighing at 60-pounds and having a capacity of 80 gallons and more, it has interior fins for mixing the compost. Moreover, it has a removable door to ease the loading and unloading process. And at optimum conditions, it takes almost 4-6 weeks. The base wall has galvanized steel construction, thereby making it corrosion-proof. Finally, the black-powder coating will not allow the formation of any rust. Backed by a 2-year warranty period. Works at a 3-step compost production process too. Its handle is not just easy-to-spin but also gear-resistant for ease of usage. Both food-grade plastic and BPA-free construction. Maintain the hygiene of your home and create useful compost out of the waste. Indeed an environmentally safe product.